My Romantic Home: Show and Tell Friday! Welcome to Show and Tell Friday! I bought a couple new necklaces this week and as I hung them up behind my bedroom door I realized this is a corner in my home that I've never shown! I bought this piece with three hooks on it a few years ago at Marshalls. I have so many necklaces that I really should try to find a couple more of these! They work really well, and keep the necklaces from getting all tangled up. I also have a weakness for bangle bracelets. I keep mine stacked over a perfume bottle. I think I'm going to get a standing paper towel holder though because I'm running out of room because I have so many bracelets! I keep my earrings in this, which I also got at Marshalls. I keep this hanging in my closet and just pull it out every morning to pick out my earrings! I love the see-through pouches...it makes it very easy to see everything. It's two-sided so there is more space on the back! Do you have any creative ways to store your jewelry? I started my new job yesterday! I think I'm really going to love it! It's amazing how something so bad...like getting laid off, can turn into something even better! Thanks to all of you that join in every week! I'm glad to hear that your new job is going well! God works in mysterious ways! So excited for you about your new job! Big thank you for hosting S&T Friday! Congratulations on your new job!!! That's great! I like your ideas for keeping jewelry organized. Mine are in boxes, not so good. Have a great weekend and thank you so much for hosting this! 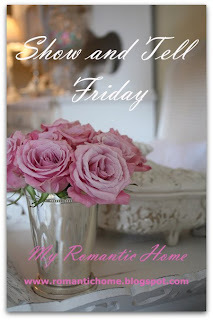 From blog to blog, I decided to stop by in this "Romantic Home" and I Loved it!!! Following you here and on Pinterest! Congratulations for the blog and GOOD LUCK with your new job!!! Thanks so much for hosting and all you do each week to make this party happen! I am so very happy to hear your job is going well! So glad about the new job! 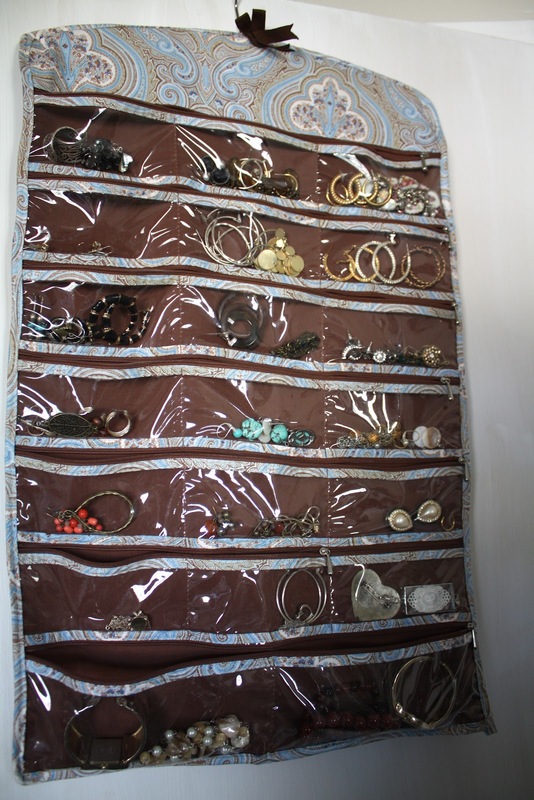 I wish my jewelry was organized as well as yours. Thanks so much for hosting. Fantastic on your new job! Thanks for hosting! Congrats on your new job, Cindy. Thanks for hosting. Cindy, it's wonderful that the new job is a great match. 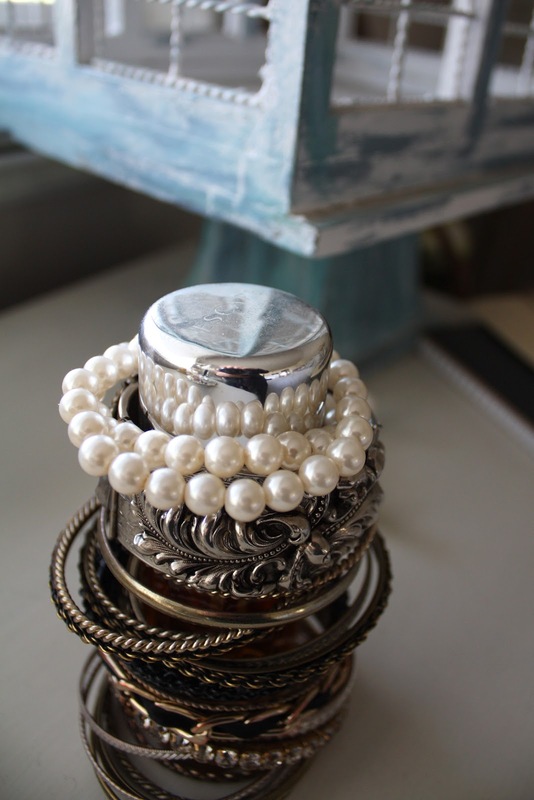 You've some clever ways to store your jewelry. One idea I've seen that looks great and is decorative too: a large bowl full of the heavy bakealite bangles. Hi, Cindy! So glad to be able to link up this week. I don't often have something that I've made for my own home to show but this week I do! Thanks for another lovely party! I use one of the plastic hinged boxes with dividers for my earrings. It works perfectly, and it's easy to put in your drawer or suitcase for travel. The box I'm referring to can be found at Joann or Michael's. I think they are for storing embroidery floss. I think you would love it! how beautiful jewelry!thank you for hosting,have a good friday. I love the way you display your jewellery. That way it is not only an accessory on you but one for your house as well. I linked up a very old maid's closet I gave a makeover. I hope you like it. Thank you for hosting this party and giving us a chance to showcase our projects. I display my necklaces just like that. I was given a very pretty rose painted wall hanger as a gift and use it the same. Thanks for hosting -- you must be REALLY busy with your new job. You have some great ideas for jewelry -- mine is a mess! Thanks for hosting and all the best! My necklaces are on command hooks in our closet. My earrings and bracelets are in my jewelry box. It's hanging on the wall, and has a hinged door that opens. On the front are spots for pictures. I love it! 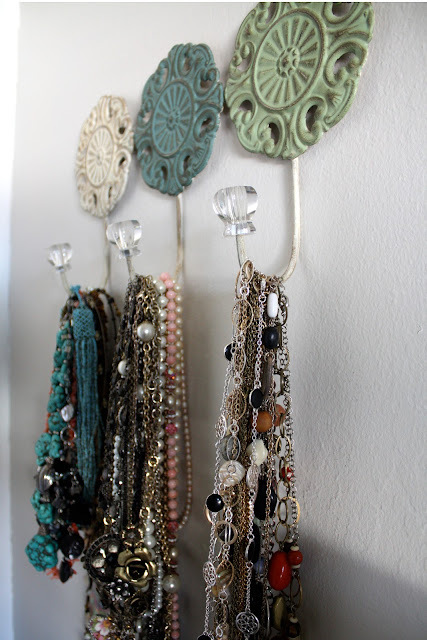 I love your hanging organizer for your earrings! yes it is good to have a job and enjoy life like we are use to . I have some of my necklaces on belt hangers. I found this hanger with loops on each side and have my old vintage glass necklaces hanging on it in a window in my studio so the light will shine through the necklaces. Another great link party...thanks so much for hosting. Have a great weekend! Hi Cindy! I'm so glad to have found your site and to be able to participate in your party. I can't wait to learn more about you. Thank you for hosting this lovely weekly party! I'm so glad you are enjoying the new job! (all 24 hours of it) ;) I hope it turns into something you never even dreamed! I really need to reorganize my jewelery. It's getting out of hand- especially the necklaces! Have a great weekend! What a great idea for my bangle bracelets. Paper towel roll holder is an excellent idea. Just have to figure out where I'd put it. I am so excited about your new job. I love the idea of the hooks behind the door with the necklaces. I can't wait to do that. Brilliant! I would love for you to share that at our WIW linky party. Thanks for hosting and congrats also on your new job! love the jolt of inspiration I get here each Friday! I linked up my Easy Laundry Soap. It's super easy to make and smells fantastic! Thanks for hosting the party once again. Have a great day! Cindy I store my jewelry in a vintage wallpaper 3-drawer chest. I also have some treadle machine drawers that I took and put knobs on the bottom for feet and that is where I keep some and one drawer is my makeup. I am so glad your job is working out for you. I hope it continues to work for you. Hope you and Lauren have a wonderful weekend. Thank you for hosting...excited to be linking up again. love the haircut! I really like those hooks for hanging your necklaces! Congratulations on your new job!! I hope you continue to love it. Also, thanks for hosting. Such great news about your new job. Good luck. Love your jewlery organizers. Great idea with the hooks. My stuff is stored in a standard insert in my bureau. Thank you for the opportunity to share on your page; it led to my first blog comment! I'm so glad for you that you love your new job, it's important, we spend so many hours at work. I love your jewelry, you have so many and they all look so beautiful ! You gave me such good ideas to hang and store bracelets and necklaces. I might try the hooks and pouches. Have a nice week and thank you for hosting this party ! I am so happy for you. You worked hard to get here and are very generous with your blog. You will be amazing.